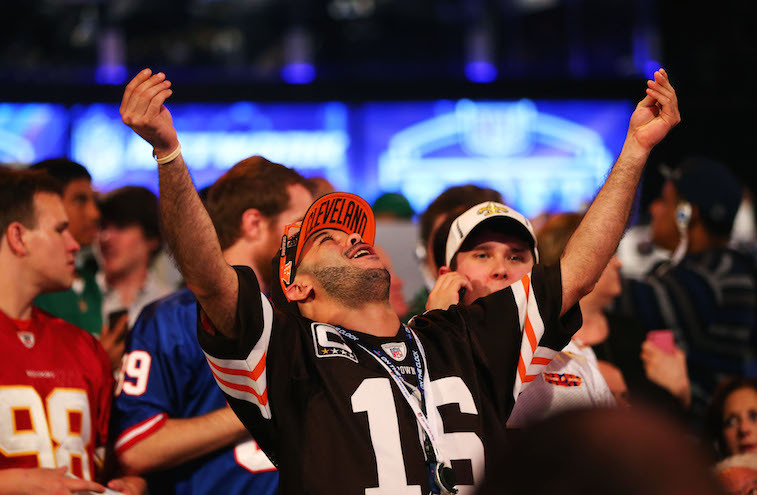 The NFL Draft has evolved into a primetime television event. One of the biggest reasons for the spike in the popularity of the draft are the shocking and unforeseen trades that shake up everything we thought we learned during the pre-draft process. 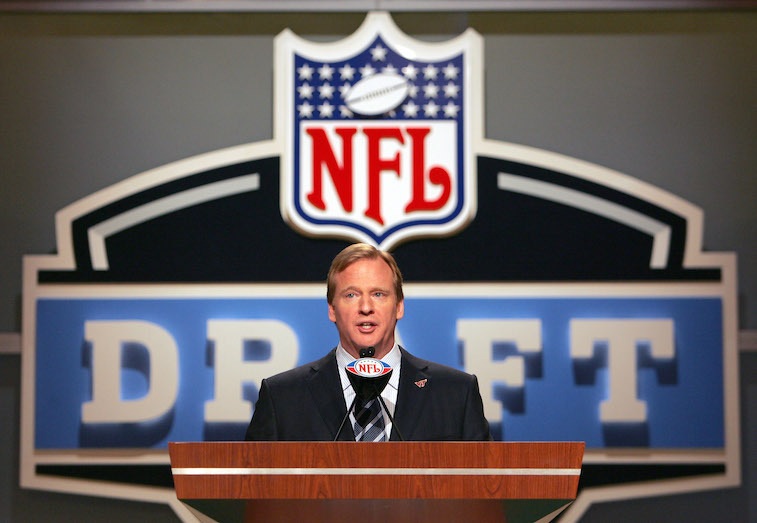 There will be millions of mock drafts published before the 2015 NFL Draft, and the odds would suggest that not a single one of them will be 100% accurate. The most widely discussed trade scenario heading into this year’s draft is the potential three-team blockbuster trade centered around former Oregon quarterback Marcus Mariota, and involves the San Diego Chargers, Tennessee Titans, and Philadelphia Eagles. If the rumored trade were to actually happen, it would completely shake up the first round of the draft and go down as one of the biggest trades in NFL history. Even if the Mariota trade fails to materialize, there will still likely be multiple trades that go down prior to, or during, the first round of the draft. However, projecting where those trades will land, or what teams will be involved, is nearly impossible. With that being said, we have scoured the rumor mills and evaluated each team’s needs as well as their assets, and come up with a list of five potential trade scenarios for the first round of the 2015 NFL Draft that make perfect sense. Here is a look at what we came up with. The Raiders’ draft plans may ultimately depend on whether former USC defensive lineman Leonard Williams is still on the board when they make their pick. If he’s available, the Raiders will likely take him. 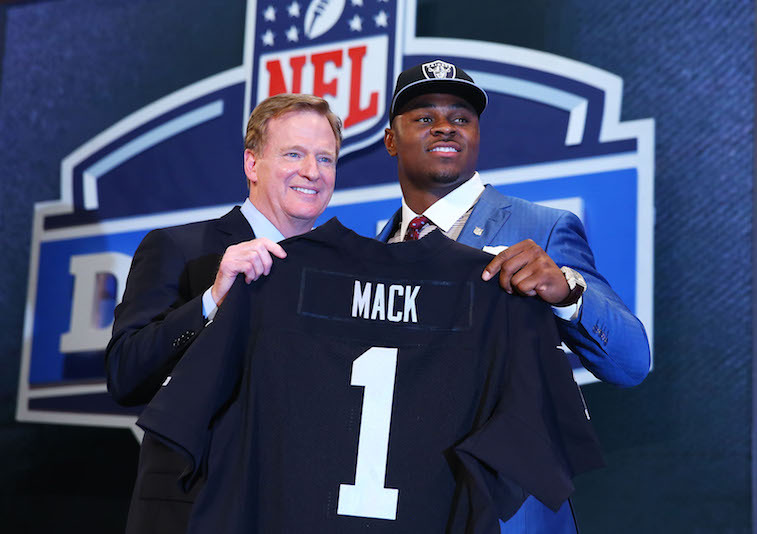 If he’s gone by the time Oakland is on the clock, there is a very good chance that the Raiders will choose to trade down and stockpile picks as they continue their rebuilding process. If they play their cards right, the Raiders could turn their No. 4 pick into multiple draft picks and at least one impact, starting-caliber player. 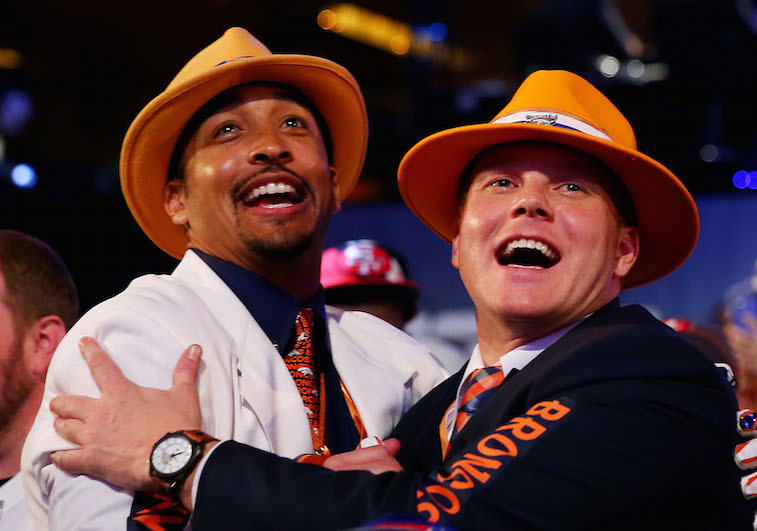 The Browns landed an extra first-round pick in this year’s draft as part of the trade they made with the Buffalo Bills revolving around Sammy Watkins in last year’s draft. The Browns have multiple needs on both sides of the ball, but none of them are more pressing than their need at quarterback. It’s probably too soon to call Johnny Manziel, one of the Browns’ first-round picks from a year ago, a complete bust, but the team can’t be expecting much out of the 2012 Heisman Trophy winner. The Browns have been linked to former Oregon quarterback Marcus Mariota for most of the pre-draft process. With two first-round draft picks at their disposal, the Browns could conceivably put together a package to trade up and select Mariota if they are so inclined. Simply put, the Jets need help all over the field. They still desperately need a quarterback after Geno Smith has proven to be a bust, and they could very well take Marcus Mariota or Jameis Winston if either player happens to fall into their laps at No. 6 overall. That scenario is unlikely to happen, which means the Jets can either stay put and select the best player available, or they can shop the pick around the league and possibly stockpile future picks. 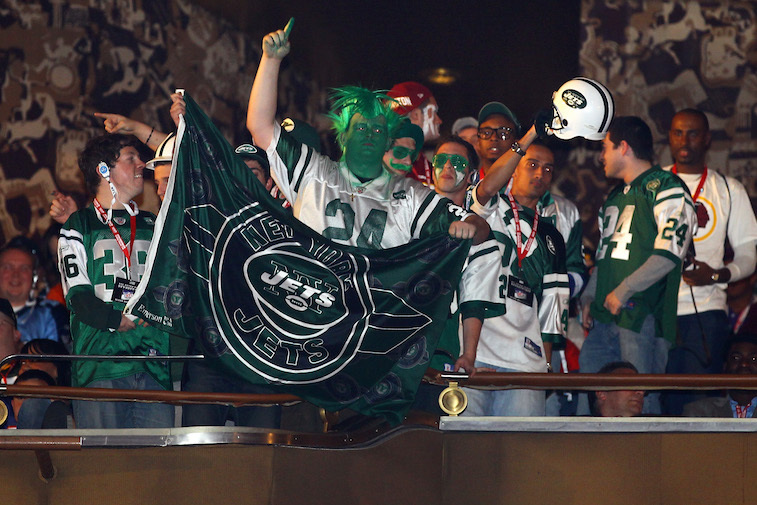 Our guess is that new General Manager Mike Maccagnan chooses the latter and attempts to unload the No. 6 overall pick to load up on additional draft picks and/or veteran players. The Broncos’ window of time to win a Super Bowl with Peyton Manning at quarterback is rapidly shrinking. If they are going to have a chance to contend for a championship in 2015, the Broncos will need to be vastly better along their offensive line. They have already added guard Shelley Smith and center Gino Gradkowski to the mix this offseason, but the team remains desperate for an impact right tackle. Don’t be surprised if General Manager John Elway pulls the trigger and trades up in the first round if the Broncos fall in love with one of the offensive tackle prospects in the 2015 draft class. The Saints are in desperate need of an offensive weapon after trading All-Pro tight end Jimmy Graham to the Seattle Seahawks. As a part of the Graham deal, they picked up the Seahawks’ first-round pick — No. 31 overall. The Saints can now potentially package that pick with their own pick, No. 13 overall, and move far enough up in the draft to land one of the top two wide receivers available, Kevin White or Amari Cooper. For the Saints to return to contention in the NFC, they will need to reestablish their explosive offense, and landing White or Cooper would help in a big way. On the other hand, the Saints, who have holes to fill all over the field, could also choose to stay put and use both of their first-round picks to help rebuild their roster. This year’s crop of wide receivers is one of the deepest in recent memory, so there will be explosive players available beyond the draft’s first round. 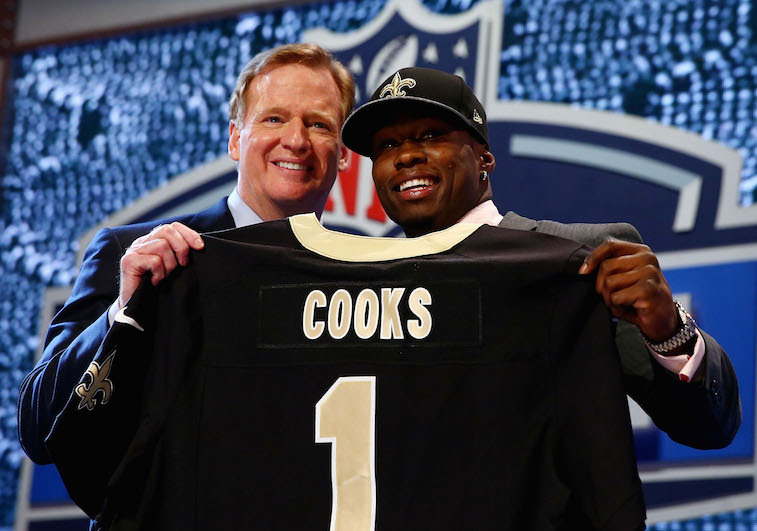 Nonetheless, the idea of adding a player like White or Cooper could prove to be too much for the Saints to pass up.